Living in a houseboat on a tree-lined canal in the middle of Amsterdam may offer many advantages, but a large, live-in kitchen is rarely among them. So when you step into the floating home of Ingmar Visser and Jaro van der Ende, the expansive kitchen comes as a real surprise—more downtown loft than nautical galley. 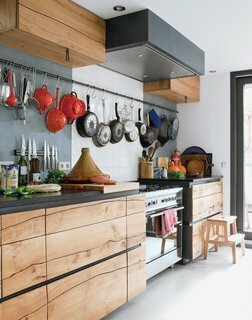 With its beautifully handcrafted elm cabinets, clean, uncluttered lines, and sunny outdoor terrace, it’s more than a space for cooking. "The kitchen is the real heart of our home," says Van der Ende, cradling three-week-old daughter Pien at the big wooden table. "We spend most of our time here, or outside on the terrace."